Dozens of the stars attending the opening predicted an Oscar sweep for Judy Garland, James Mason, Jack Carson, and A Star is Born. One of the last great Hollywood premieres. This is a great video on the Hollywood premiere for STAR IS BORN at the Pantages Theatre. Lot’s of fun and a look at the past when there were more stars in Hollywood than there were in the heavens. Warner Bros. films had been shown at the Warner Theatre Hollywood but it was being used for Cinerama. The Pantages Hollywood released RKO, Columbia, Disney films and was host to the Oscars for many years. 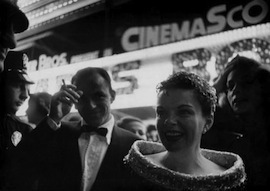 Documentary (14 mins long) about the premiere for the Judy Garland/James Mason film “A Star is Born” – most of the action takes place at the Warner Theatre, Leicester Square, London. Commentary by Richard Attenborough and Sheila Sim. Next: 1949: 3-Week MISSISSIPPI Cruise aboard the steamboat GORDON C. GREENE – Ten Dollars a Day!